On November 18, 2011, Senator Grassley (R-IA) and Senator Bill Nelson (D-FL) introduced the Small Business Efficiency Act into the Senate (S. 1908). This bill is the Senate version of the House Bill, H.R. 2466. Senator Pryor (D-AR), Senator Portman (R-OH), Senator Bingaman (D-NM) and Senator Conrad (D-ND) have also joined as co-sponsors. The House version was introduced by Representative Kevin Brady and Representative Mike Thompson and is co-sponsored by Representatives Rob Andrews, Tim Bishop, Dennis Cardoza, Sean Duffy, Blake Farenthold, Nan Hayworth, Wally Herger, Ralph Hall, Sam Johnson, Pete Olson, William Owens, Erik Paulsen, Ted Poe, Tom Reed, Paul Tonko,and Allen West. The Small Business Efficiency Act of 2011, H.R. 2466/S.1908, would provide clear rules for Professional Employer Organizations (PEOs) that are voluntarily certified by the IRS to collect and remit federal employment taxes for their small business clients. It will provide certainty for small businesses that use certified PEO services and will allow those small businesses to do what they do best- focus on their core business, grow their businesses, and create more jobs. The National Association of Professional Employer Organizations (NAPEO) is the trade association for and voice of the professional employer organization (PEO) industry. NAPEO has more than 300 PEO members operating in all 50 states, representing more than 85 percent of the industry’s $81 billion in revenues. PEOs help small- and medium-sized businesses with human resources, compensation, and employee benefits issues. Through the economies of scale, PEOs improve compliance with federal and state employment taxes, benefits laws, and often provide retirement and health benefits to workers that were not available prior to the PEO arrangement. 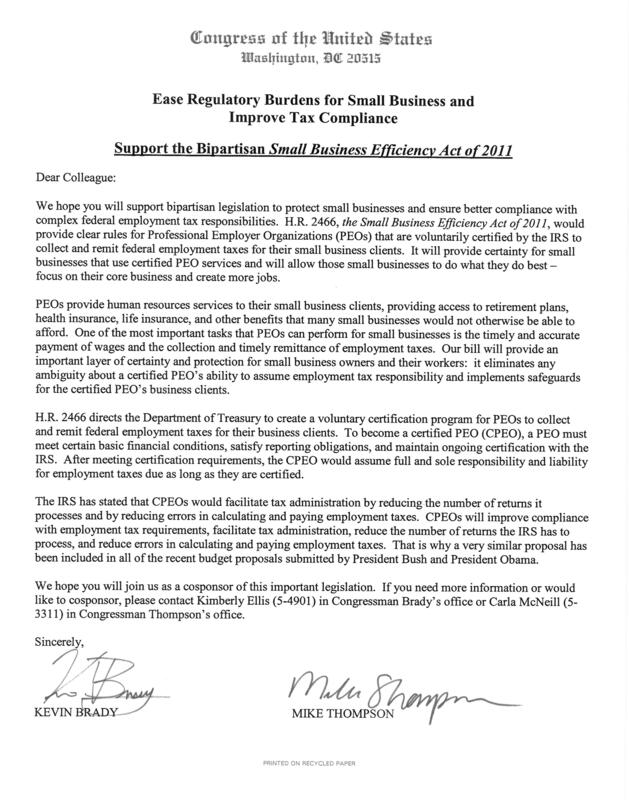 NAPEO has endorsed The Small Business Efficiency Act of 2011 (H.R. 2466/S. 1908), sponsored by Representatives Kevin Brady (R-TX) and Mike Thompson (D-CA), along with Senators Charles Grassley (R-IA) and Bill Nelson (D-FL). These bills clarify current federal tax law to eliminate any uncertainty about the ability of PEOs to assume liability for paying wages and collecting federal employment taxes for workers. The bill creates a voluntary certification program for PEOs (CPEOs) that meet standards of solvency and responsibility, and that maintain ongoing certification by the IRS. To be certified by the IRS, a PEO must meet stringent standards, including having no criminal record, having no unpaid taxes, and obtaining financial reviews from independent CPAs. In addition, the CPEO would post a bond for the payment of employment taxes. CPEOs must also accept sole liability for the collection of federal employment taxes with respect to worksite employees performing services for PEO clients. WHY SHOULD CONGRESS PASS THE SMALL BUSINESS EFFICIENCY ACT? It Promotes Good Government: CPEOs would facilitate tax administration by reducing the number of returns processed and by reducing errors in calculating employment taxes. In addition, the bill would improve compliance by accelerating the timing of collection of employment taxes because CPEOs deposit taxes more quickly than their small business clients. Both Presidents Obama and Bush have included comparable proposals in their budgets and TIGTA has called for legislation that would certify PEOs with conditions like those contained in the Small Business Efficiency Act. 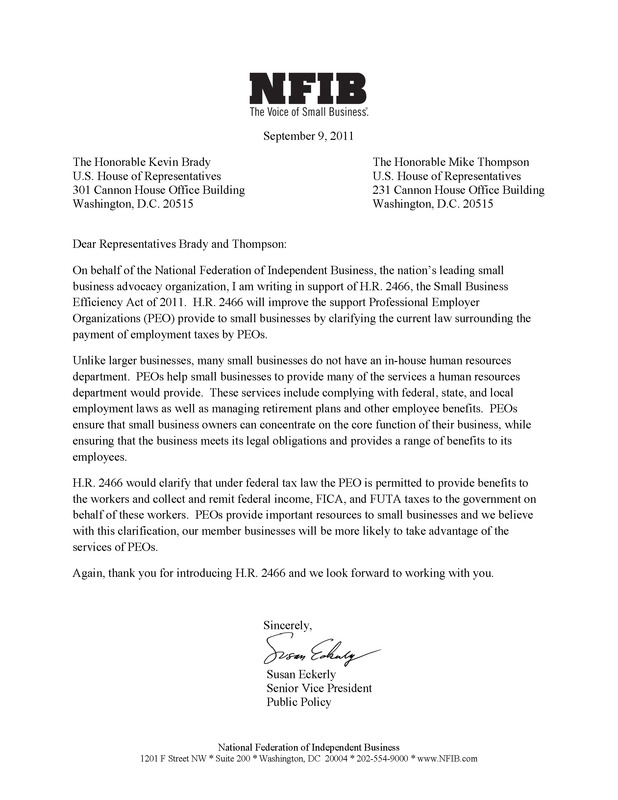 The National Association of Professional Employer Organizations (NAPEO), the national trade association for the PEO industry with approximately 350 PEO members operating in all 50 states, representing more than 90% of the industry’s $68 billion in revenues, has endorsed HR 2466, the Small Business Efficiency Act of 2011. NAPEO’s PEO members range in size from start-up PEOs to large, publicly held companies with years of success in the industry.